(INDIANAPOLIS) - The Indiana Housing and Community Development Authority (IHCDA) and Corporation for Supportive Housing (CSH) were recently named recipients of the Key Award for Program of the Year by Prosperity Indiana. 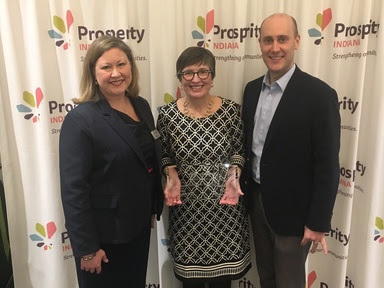 The award, which was presented earlier this week at the 2019 Prosperity Indiana Summit, is for their Indiana Supportive Housing Institute. "This award is a testament to the hard work of dozens of organizations who have participated in the Institute and partnered to create permanent supportive housing in our state," said Jacob Sipe, Executive Director of IHCDA. "This honor is especially fitting as we, along with CSH, embark on our 10th year of the Institute." "The honor goes to the supportive housing providers and partners that have leveraged their Institute experience to create hundreds of stable homes for people who were once struggling on our streets, and facing problems exacerbating their homelessness," said Lori Phillips-Steele, Director of CSH initiatives in Indiana. "The real winners are the formerly homeless now thriving in supportive housing because these providers have been innovative and are committed to solutions." The Key Award honors excellence and innovation in a service-oriented community development initiative. This award recognizes a unique program model that leads in the area of service provision and/or volunteerism. "We are proud to honor collaborative efforts that are making an impact on reducing homelessness - specifically addressing the chronically homeless - in this state," said Jessica Love, Executive Director of Prosperity Indiana. "The uniqueness of the IHCDA and CSH partnership and alignment of resources makes it stand out as a program deserving of this level of recognition." The Institute is designed for organizations to develop detailed, individualized supportive housing plans. IHCDA and CSH recently announced the six teams that will be participating in 2019. As part of this year's Institute, teams will work closely with IHCDA and CSH through a series of targeted training and group exercises. They will also be provided with technical assistance and presented with pre-development financing opportunities. The Institute will culminate with the Finale this summer where teams will present their plans to a group of public and private investors. Since the Institute started, nine classes of teams have graduated. This has helped to contribute to a significant reduction (38%) in chronic homelessness in Indiana and hundreds of units of permanent supportive housing. Pictured from left to right is Prosperity Indiana Executive Director Jessica Love, Director for CSH Indiana Lori Phillips-Steele and IHCDA Deputy Director and Chief Real Estate Development Officer Matt Rayburn. The Indiana Housing and Community Development Authority (IHCDA), chaired by Lt. Governor Suzanne Crouch, provides housing opportunities, promotes self-sufficiency and strengthens communities in order to build an Indiana with a sustainable quality of life for all Hoosiers in the community of their choice. For more information, visit www.ihcda.in.gov or www.in.gov/myihcda. CSH looks to advance solutions that use housing as a platform for services to improve the lives of the most vulnerable people, maximize public resources and build healthy communities. In Indiana, CSH works closely with the Indiana Housing and Community Development Authority to stimulate the creation of supportive housing for fragile individuals and families who are experiencing homelessness. http://www.csh.org/.